Crete suites and bungalows in Kokkini Hani, Knossos Beach, an ideal waterfront resort for calm and peaceful vacations for you and your family or your friends. A Crete hotel that will show you the hospitality of the Cretan people and philosophy and will offer you plenty of unforgettable moments of relaxation and recreation. 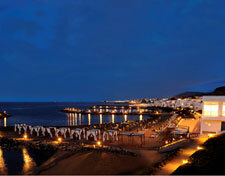 Knossos Beach is located close to Heraklion and is built along two private sandy beaches. A hotel in Crete that combines quietness of the area to traffic and intense night life of the center of Heraklion. Hotels in Crete are famous for their amazing hospitality and services, especially Knossos Beach and its personnel have as a main concern the satisfaction of the needs of the most demanding guest. Visit our Crete hotel and enjoy luxury vacations. Experience the blue The Knossos Beach Bungalows & Suites is a family owned resort located on the north coast of the picturesque island of Crete, Greece. One of the few privileged hotels, lying directly on the sea front, it spreads along two private sandy beaches with crystal clear waters in well secluded bays, offering guests, unparalleled panoramic views of the magnificent blue Aegean Sea.